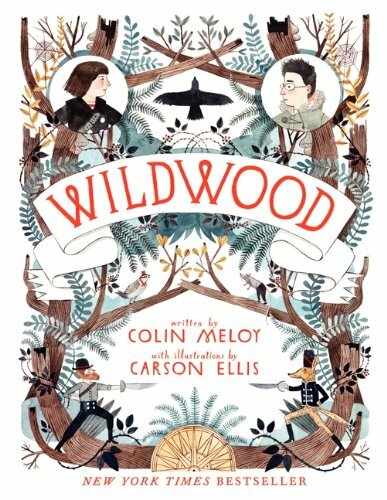 Wildwood captivates readers with the wonder and thrill of a secret world within the landscape of a modern city. It feels at once firmly steeped in the classics of children’s literature and completely fresh at the same time. The story is told from multiple points of view, and the book features more than eighty illustrations, including six full-color plates, making this an absolutely gorgeous object. I picked this book up after hearing about it for sometime. It is labeled as a children’s book, but I would consider it more of a YA or teen book. The main reason I picked up this book is that it takes place in Portland. I grew up west of Portland and am familiar with the locations in the books. This book makes you feel like you are in Portland. It talks about the Pittock Mansion. It talks about the weather, certain types of flowers, and blackberry brambles. All things you will know well if you have spent much time in the Pacific Northwest. I loved this about the book. I have mixed thoughts on this book though. Many people compare this book to the Chronicles of Narnia. I can kind of see that comparison, but Chronicles of Narnia it is not. At least in my opinion. The writing is good, but not great. I didn’t get lost in the imaginary world like I did with C.S. Lewis and Narnia. I also found many things about the book weird, in a creepy way. The witches and what they do is just odd and creepy to me. It is the main reason why I don’t think I would have a young child read this. My overall thought is that I am glad I read it, but not sure I can recommend it as a great read. If you or your child love fantasy type books, you might enjoy it.